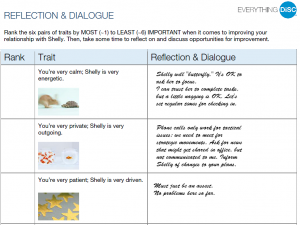 Ask participants to choose a quality from their profile that they strongly identified with. Then have them share with a partner or small group how that quality has been a strength, liability or both in their career. How do they try to capitalize on it when it can be a strength and how do they deal with it when it is a liability? You can also have them choose a quality they do not identify with and describe how they have seen another person use it as a strength and how they’ve seen it as a liability in another person. You can use QuikDiSC® Cards for this activity. A popular activity is to bring a group back together and ask each one to say what they appreciate about the person they are paired up with, or even about each person in their group. Some facilitators prefer to have participants write these notes by hand and deliver them to each other. 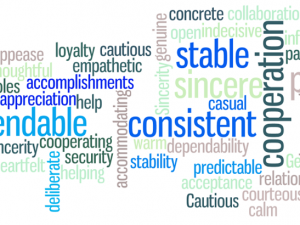 Traits appreciated should relate to the person’s DiSC priorities. If people in your group are Pinterest users, ask each of them to create a board for their style or all styles. 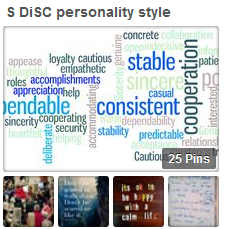 Use our DiSC Profile styles Pinterest boards as an example. (You can always use magazines, scissors, and glue to create an old-fashioned board without the use of the Internet.) Follow up by asking each participant to explain why they chose their images and allow for group discussion. You might discover very similar images on boards for different styles. Use this opportunity to clear up any confusion about the styles and to discuss how people are more than their DiSC style. We are all able to appreciate images that might be more associated with another style. Ask participants how they react to the boards of other styles. If you were to create a board showing your aspirations and goals for self-improvement, would you choose images from the boards created by participants with a different style than your own? What can you learn from someone with another style? Can you assign a style? Go to a site like RedBubble or Pinterest that has lots of images. Ask participants to decide which style is most likely to be interested in which designs. People can give a show of hands for how they assigned each image. Then ask the people who represent each type if they agree with the selections others made for their style. There will be lots of disagreements and some spot-on assignments to a style. Debrief the group about how this shows that DiSC provides some guidance with how to interact with or expect from each style, but it does not make it possible to actually pigeonhole them. Each person is still an individual, with their own idiosyncrasies. Choose a website such as Amazon.com or RedCross.org; display, project, or otherwise share the home page; and ask participants to review how effective it might be at motivating each DiSC style to make a purchase or donation. Ask the group to imagine that they were responsible for selling a new antiperspirant (or product related to their organization.) What type of advertising would they recommend for each style? What slogans can they come up with for each of the DiSC styles? Bring participants together after six weeks for a one-hour session built on a few case studies. 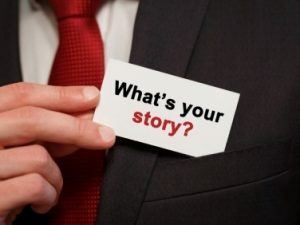 Let the participants or client suggest the case studies. They should reflect common problems they deal with everyday such as a meeting that never starts on time, high noise levels in the cafeteria, or persistent problems between the sales and marketing departments. You’ll need to write their ideas up as case studies (just a few paragraphs about the problem, conflict, or issue). Break the participants up into groups of 4 – 6 people each. These groups review and discuss the case studies and then a representative presents how they saw the DiSC styles represented in the study and possible approaches to use to resolve the issue(s) presented. Allow time for the other groups provide feedback. 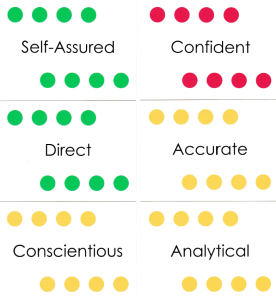 Each week two people on a team or in a department can meet to go over their comparison reports. They can fill out the Personalize and Apply sections of the report together. This is particularly helpful with your off-site employees and consultants. What’s the culture of the group? Do you feel like you have a place in it? How are tasks assigned? How do people communicate? Does the group’s culture differ from the larger organization’s culture? How do the DiSC styles of individuals in the group increase the groups effectiveness? 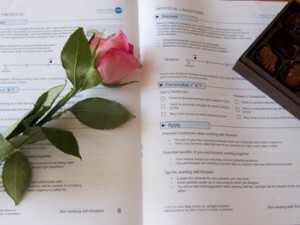 You can also ask participants to create a Pinterest board (or paper-based facsimile) that reflects their team’s style. 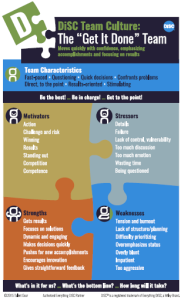 Use this with the Group Culture Report to generate discussions about how their team could be more effective, supportive, energetic, strategic, etc. Do you have any training ideas to share?